There are so many reasons why I love summer: the sunshine, the days that never end, going for walks outside after dinner…in the daylight…while wearing a t-shirt. And there is no better place to enjoy the long, warm days of summer than at a good old fashioned country fair. 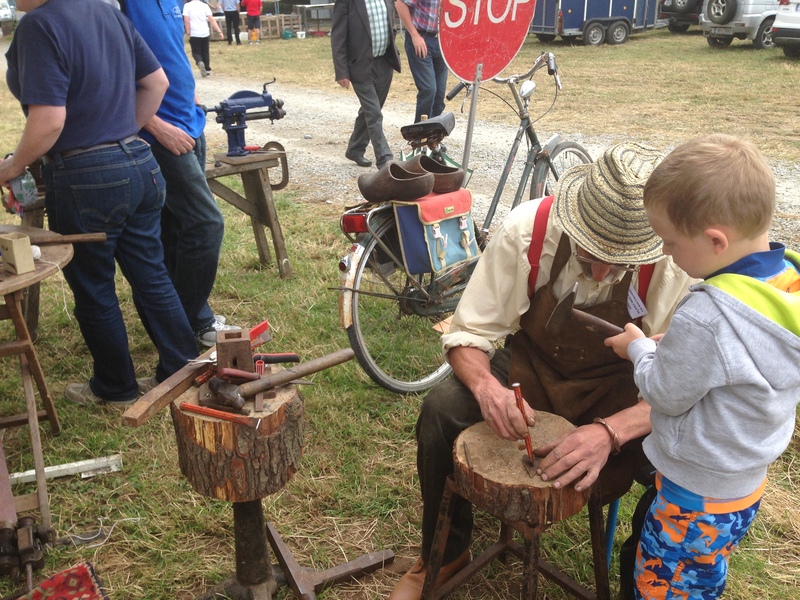 When I found out that one of the largest fairs in Ireland was taking place this weekend in West Cork, I just knew I had to go. I mean, how could we not see a country fair in a country that is known for their country-ness? Jon is travelling in Korea for work this week, so it was just me and the boys. 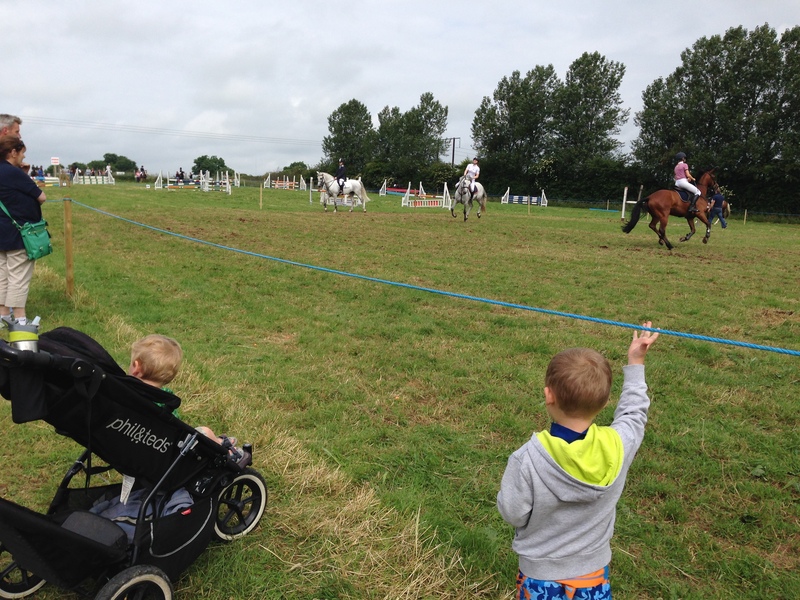 We skipped out of town on Sunday morning and headed out to the Charleville Agricultural Show, located an hour west of our home in Cork. After getting our fill of so-fast-horseys we made our way through the maze of vendor stalls. The brightly-colored toys and balloons caught the boys’ attention. And, since I want to coerce them into enjoying the fair as much as I do, I indulged them each with a new ball. The boys thought they’d won the lottery. I decided to take advantage of some momentary peace while the boys sat contentedly in the stroller admiring their new balls. We continued browsing the vendor stalls, where they were selling everything from clothing to ancient-looking farm tools to homemade jams to high-tech cow milking stations. True story. I even bought myself a little souvenir from one of the antiques stands, a metal sign that I will hang outside our house. It reads Cead Mile Failte, which translates to “a hundred thousand welcomes”. Reflecting upon our time here in Ireland, I can not think of a more fitting phrase to display in our home. Then it was on to the amusement park rides. 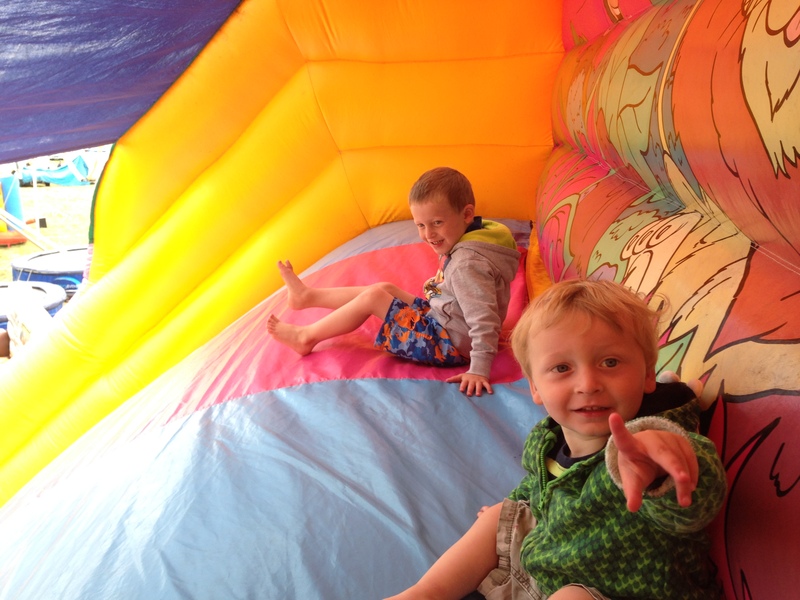 Most of the rides were a bit too big for my little guys, so we spent our time on a huge inflatable slide. It was a hit. One of my favorite sections at the fair was the old time crafts exhibit. 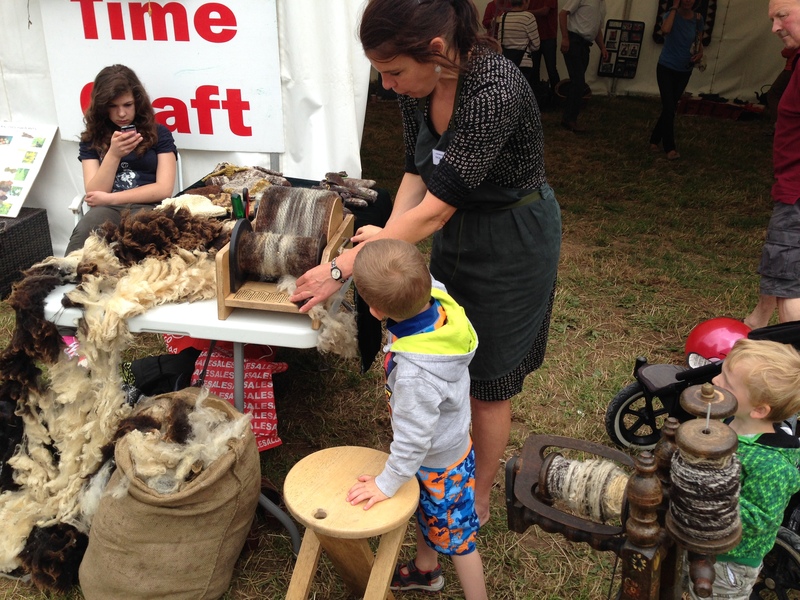 They had people there demonstrating how to make felt from wool, weave wicker baskets, and chisel letters into stone. David even got to help a woman spin yarn on an old-fashioned spinning wheel. They started by “brushing” the wool (which came from the sheep shearing demo at the fair earlier in the day) with these huge roller brushes. Then they fed the smooth wool into the spinning wheel and wove two bobbins of string together to make the yarn. Grammy Pete would have been impressed! David also tried his hand at metal-working. A very brave craftsman (with very tough looking hands) allowed my three-year old to bang a hammer on a metal rod that he was holding. After our busy morning, we needed some nourishment (nevermind that we’d already eaten cotton candy and ice cream before 11:00). We noshed on some burgers and fries…because what else would you eat at the fair? 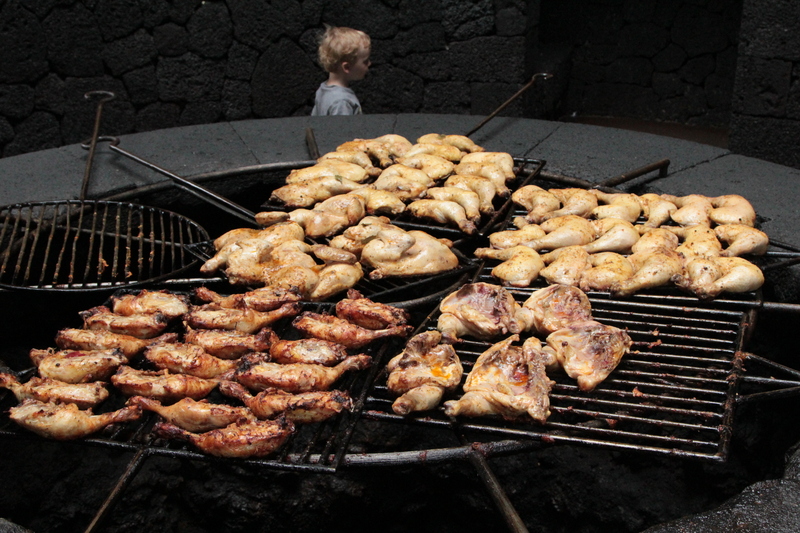 After lunch we wandered around some more and found some cookery demos. 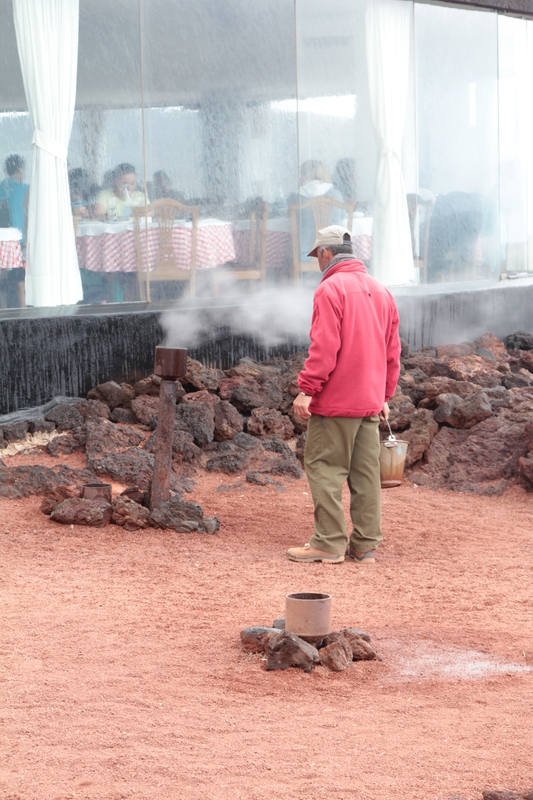 At one table they were churning butter by hand–and giving out free samples. It was the most creamy smooth butter I’ve ever tasted. We liked the butter so much that I bought a big tub of it to bring home. After all, who knows when the next time is that I’ll have access to hand-churned butter. Before calling it a day we made one last stop in the arts and crafts tent to check out the local talent. There was kids’ artwork, handmade Limerick lace, poetry, and lots of home baking. I, of course, wanted to sneak a taste of every cake I walked past, but I managed to restrain myself: At this point Jacob had fallen asleep in the stroller and David was on the verge of three-year old meltdown, so I read the signs and made my way back to the car (which was parked conveniently close to the exit, due to our “early” arrival that morning). 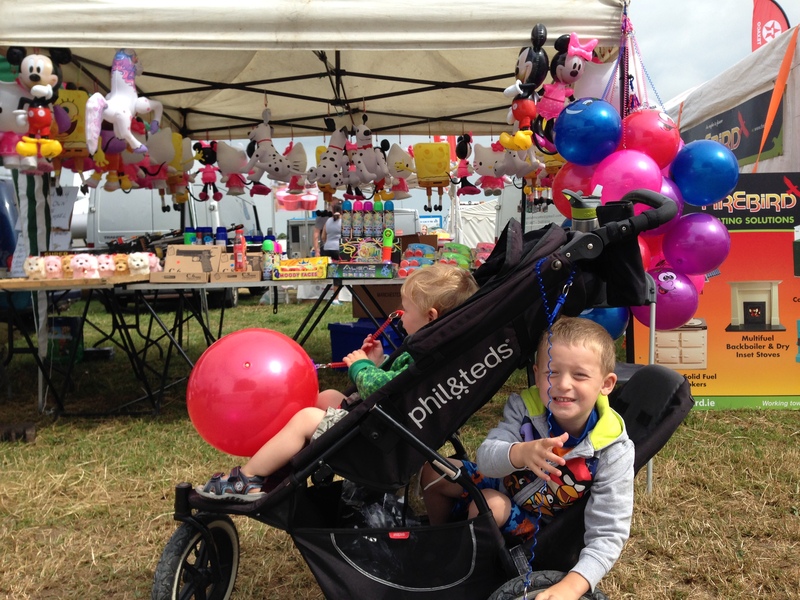 When I asked the boys later that evening what their favorite part of the fair was they both said, “EVERYTHING!”. And that, my friends, is what we call a success. 1. Put a few frogs into each container and fill with water until the frogs are just covered. Freeze for 2 hours or until the frog-cubes are frozen solid. 3. Put the frog-cubes into the pool. Challenge your kids to see who can set the frogs free from their icy prisons. Whoever gets the most frogs out of the ice wins! -Have a color race: Hold up a solid-colored frog, set a timer for 30 seconds, and see how many items your child can find that are the same color. 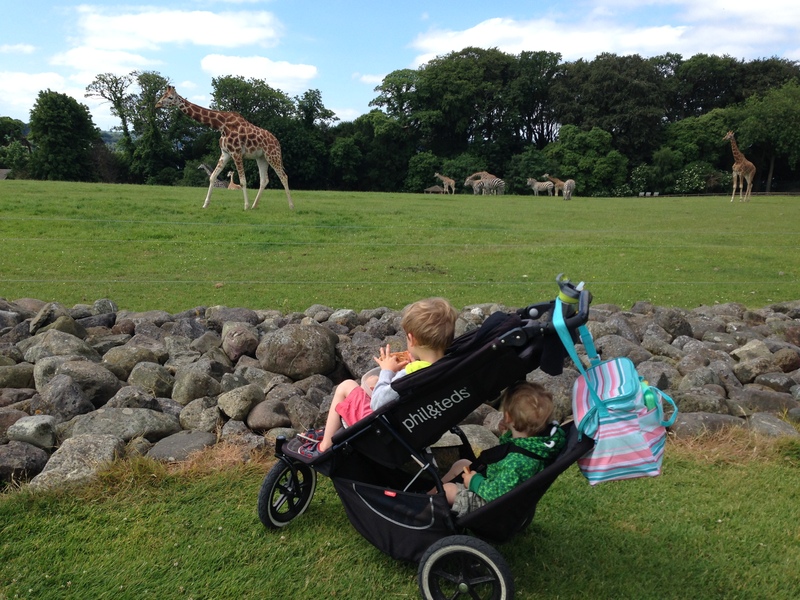 This was a significant week in Ireland: Summer finally made her appearance. 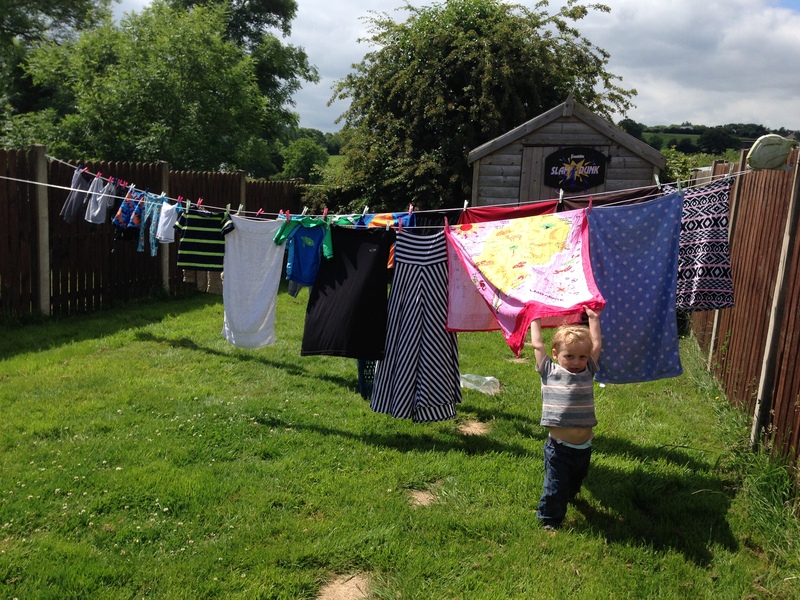 For the past 10 days we have had nothing but blue skies and sunshine–quite the welcome change from the typical Irish summer, which is only differentiated from winter by the fact that the rain is warmer. Like most people who have lived their whole lives in cold, rainy places I go a bit manic when the sun actually comes out. I feel like I have to spend every waking moment outside soaking in enough Vitamin-D to get make up for months of deprivation. I can not, will not let a single sunny moment go to waste (especially since the rain is predicted to return tomorrow). It’s difficult to squeeze a whole season’s worth of activities into a single week, but we gave it our best effort. 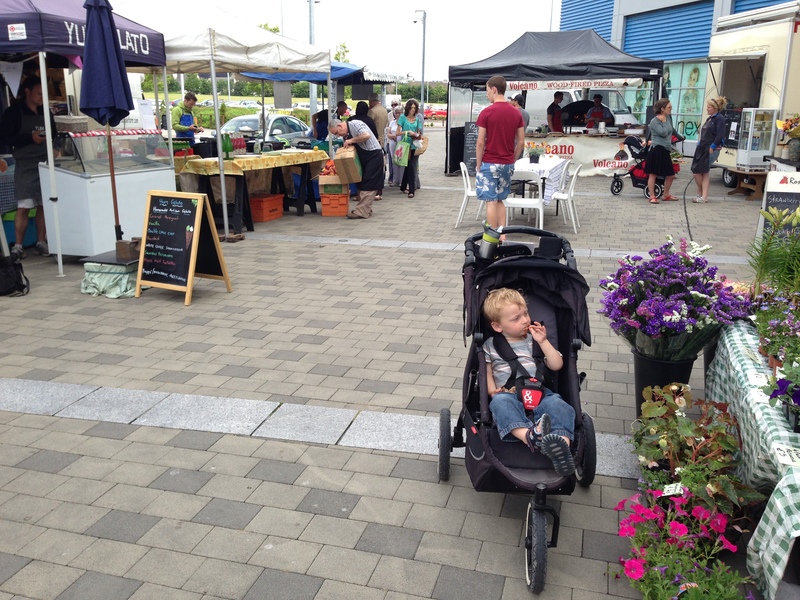 Here is a little snapshot of how we spent our week of Irish summer. After all of our hard work hiking and throwing stones, we needed a little refreshment. Popscicles (called “ice lollies” here) were the perfect reward. Many, many Popscicles were consumed this week! For our date we went into Cork City and saw Pulses of Tradition, a traditional Irish music and dance show. It was a wonderful performance with highly entertaining musicians who had us laughing and clapping and singing the whole night (we also picked up a few interesting tidbits about the history of dance and music in Ireland). After the show we stopped by our Local for some drinks before heading home. The pub was hosting a “craft beer festival”, which piqued Jon’s interest as he’s been on the lookout for a proper IPA ever since leaving Seattle. Unfortunately, the beers were not quite up to our (snobbish?) Seattleite standards–but we did enjoy a good bit of craic. Since Saturday was the summer solstice, the longest day of the year, we celebrated in style. The kids were driving us crazy so we put them to bed at 7:30, then we shared a bottle of wine, and went to bed before the sun even set. Hey, nobody ever said parenthood was glamorous. After church we came home, ate lunch, and got ready for our afternoon. Our plans were set aside, however, when the boys fell asleep while watching Engineering lectures with Jon (not sure how they could possibly fall asleep during such a thrilling activity…). I spent my surprise afternoon “off” curled up with a new book–the perfect luxury to end our season-week of summer. 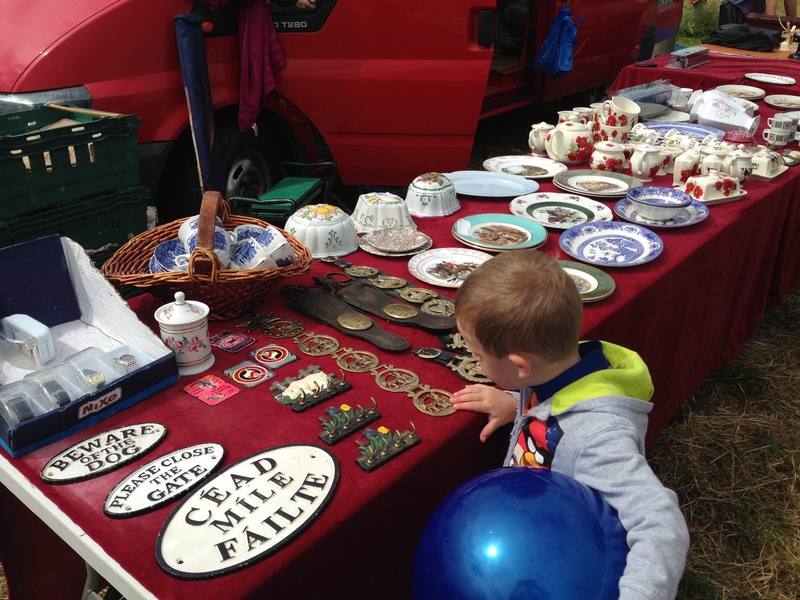 We had a memorable week exploring the treasures that are right here in Cork. 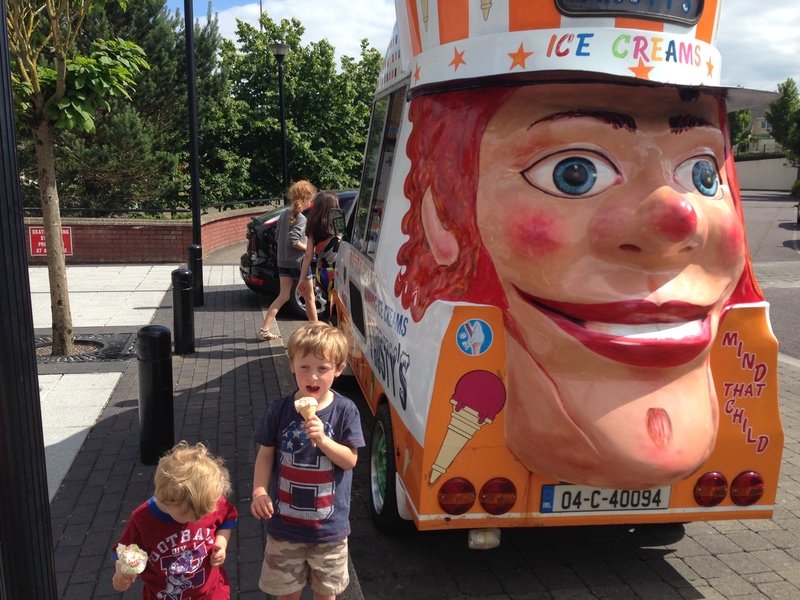 And, I have to say, summer in Ireland is pretty amazing–even if it does only last for a week! 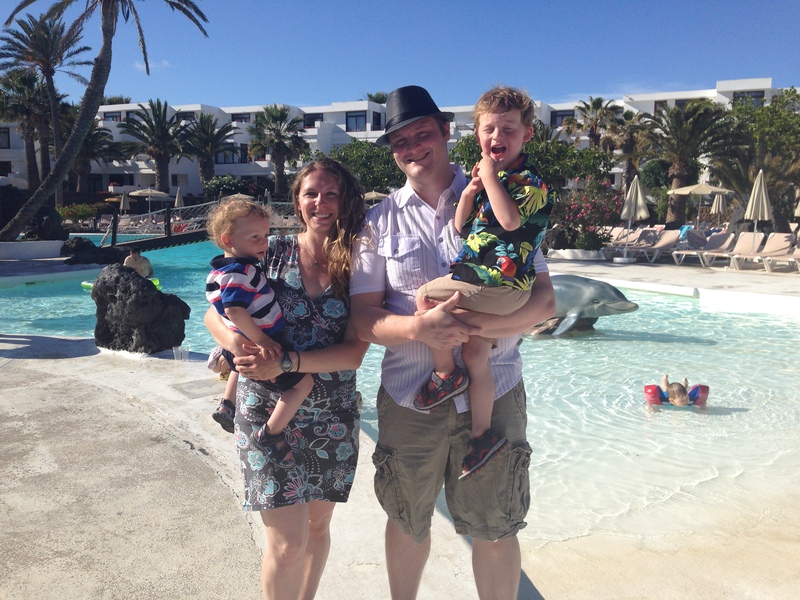 Last week was a big week for us with much to celebrate: my birthday, our wedding anniversary, and Father’s Day. With all of these big events happening in the same week, we thought it would be exciting to take a once-in-a-life time family vacation. 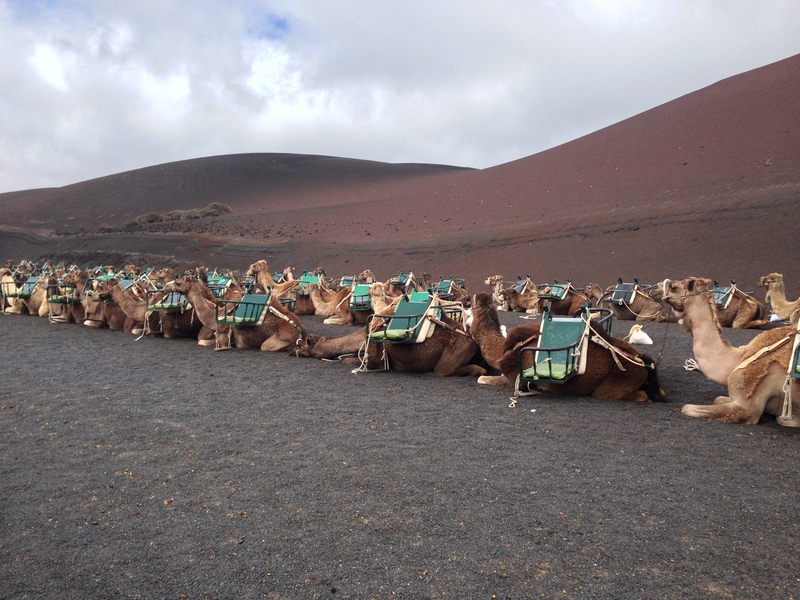 Our destination: Lanzarote in Spain’s Canary Islands. 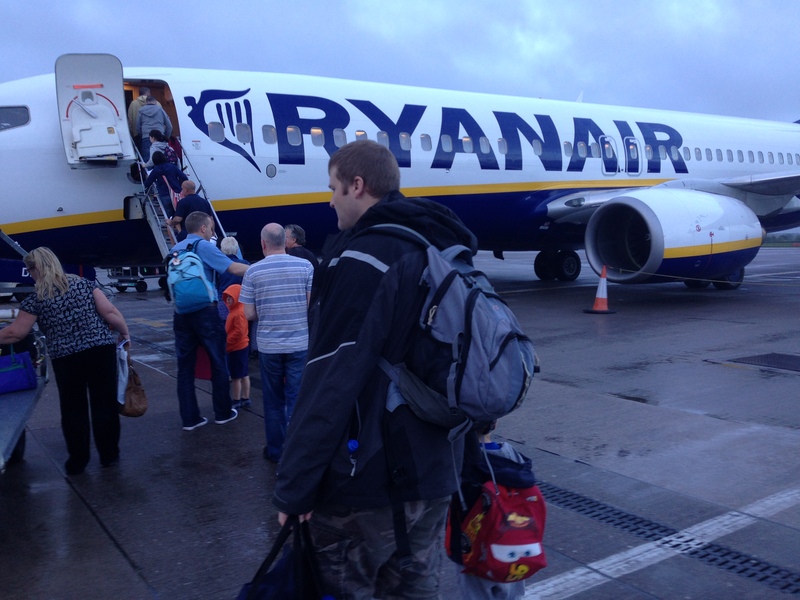 We decided to try out Ryanair, a budget airline, for the first time. We’d heard mixed reviews about the airline: yes, it’s cheap (we’re talking $15 tickets from Dublin to London…CHEAP) but it comes at a price. 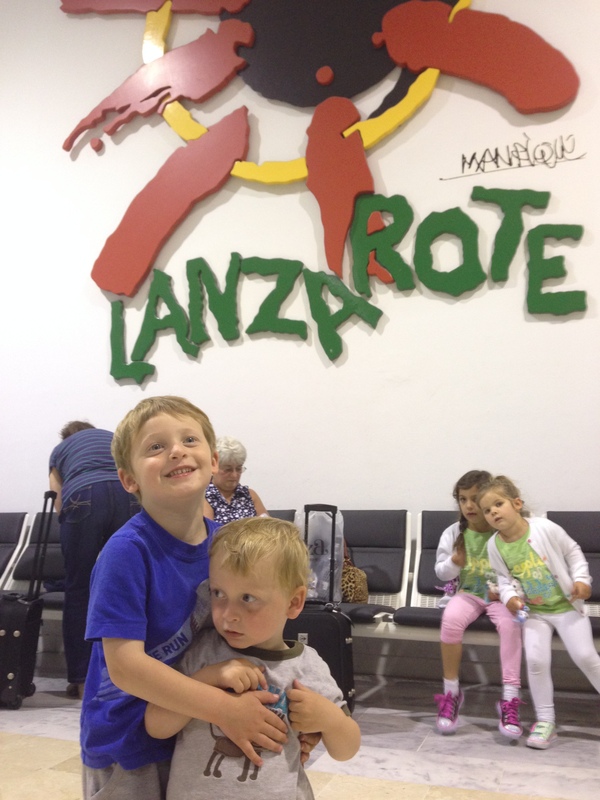 Ryanair has very strict baggage requirements and you pay extra for every little thing, so we’ve been hesitant to fly with them and our kids and our 5 billion things that our kids require every time we leave our house for even 5 minutes. In the end, though, they were much more lax than we’d heard, we had comfortable flights and, most importantly, we saved ourselves loads of money. 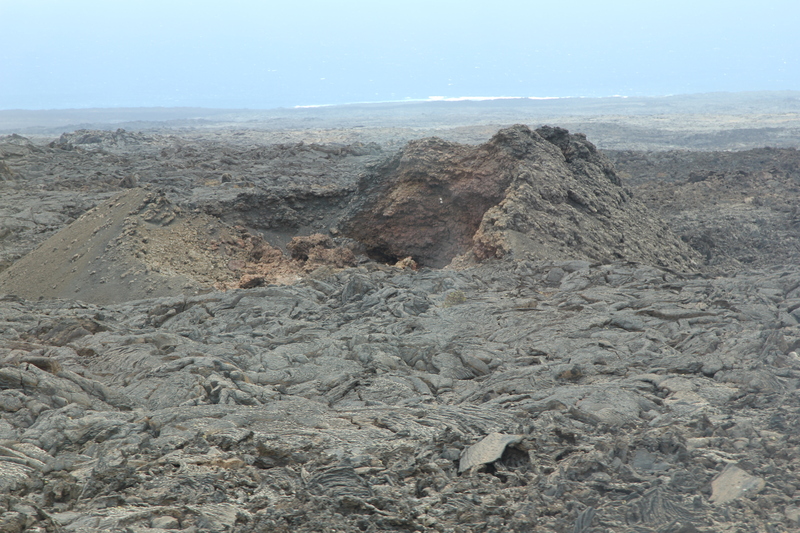 The land is so barren, in fact, that there are no sources of fresh water on the island. This could pose a problem for anyone who, you know, wanted to survive for more than 24 hours. Thankfully the resort builders thought this one through, too, and they have built desalination plants all over the island. 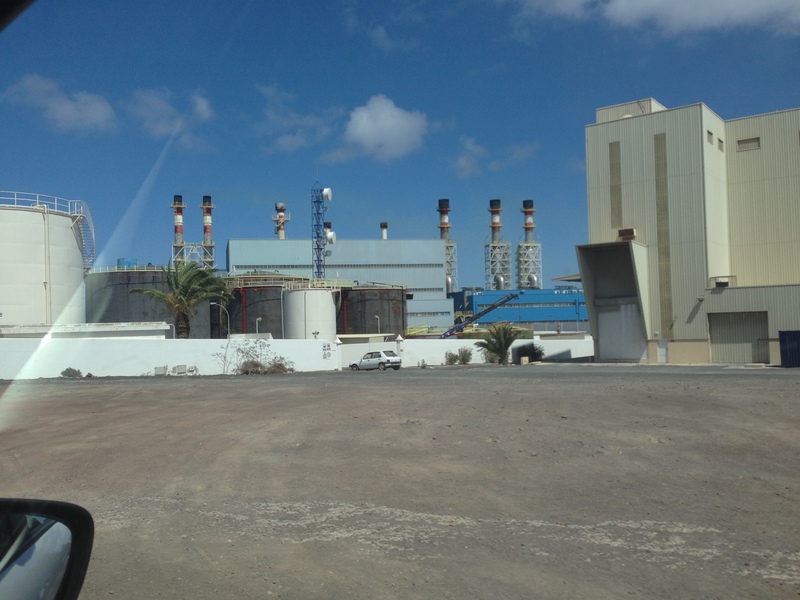 These desalination plants turn the plentiful salt water from the surrounding ocean into clean water (well, clean enough to wash your hands with and take a shower in…you still can’t drink it or anything). I’m pretty sure the island also keeps the bottled water companies in business year round with the demand for drinking water. 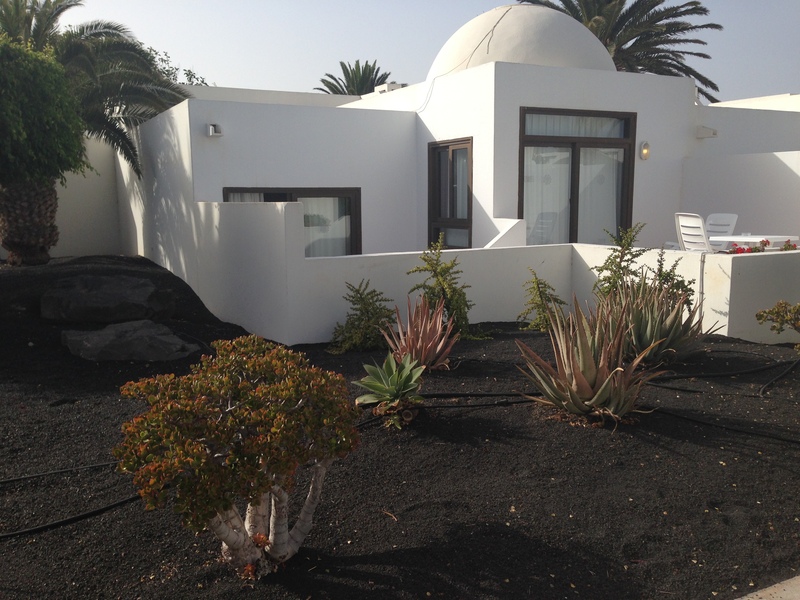 When we got to our resort (the Lanzarote Gardens, if you’re keen to know) we checked in and dropped our bags off in our room. We had a bungalow, a nice two-level place with a kitchenette and two outdoor patios. 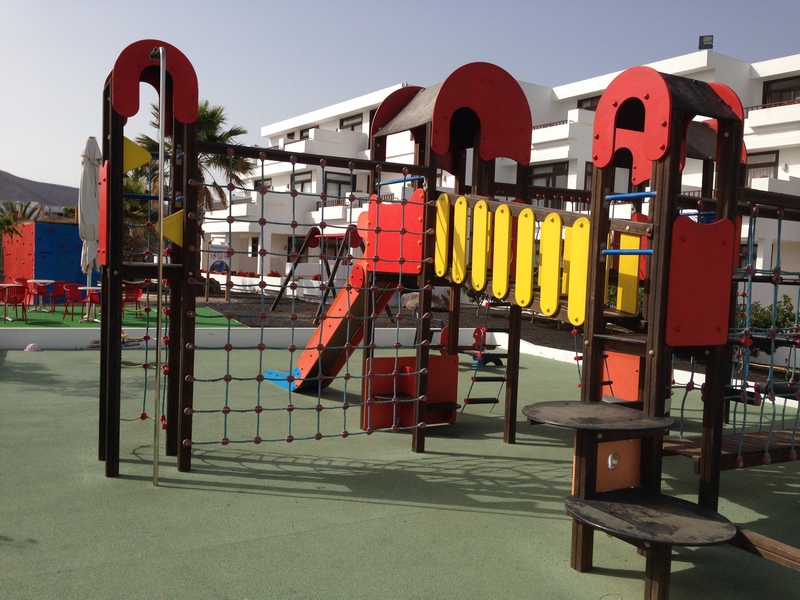 It was perfect for our family and right across the way from the swimming pools and children’s areas. 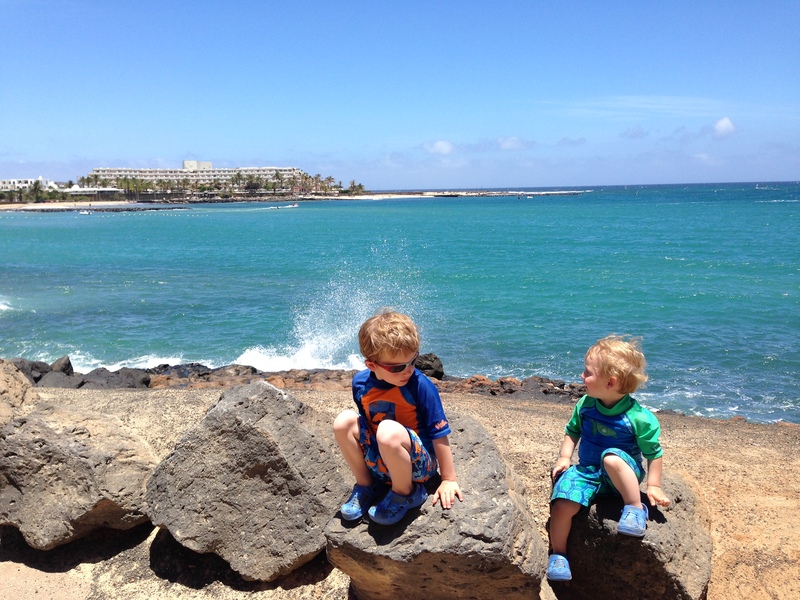 Then, after we’d gotten settled in, it was time to explore Lanzarote! 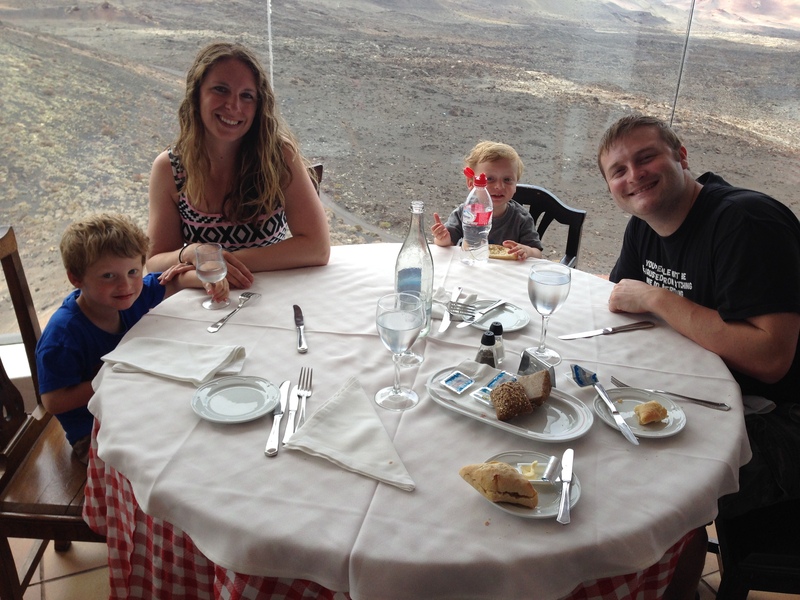 For our first full day in Lanzarote we decided to go out on a glass-bottomed boat tour. 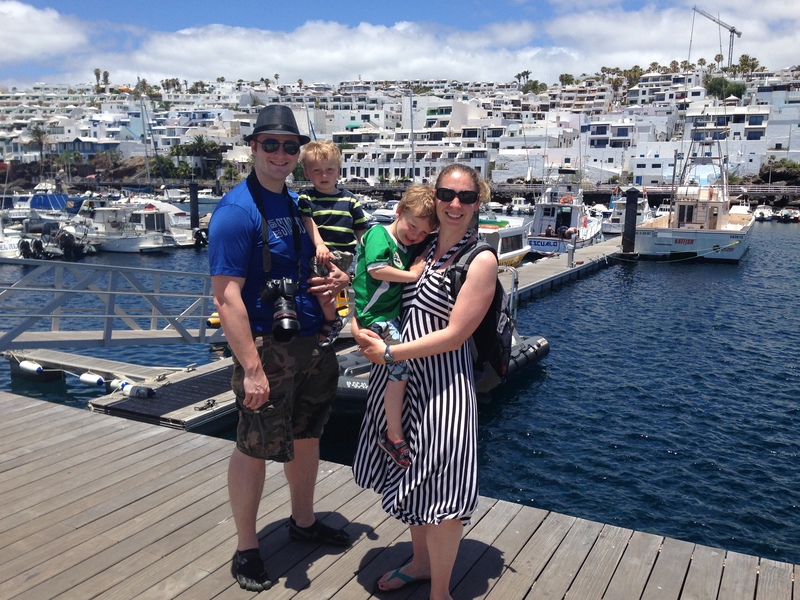 We met our boat in the nearby town of Playa Blanca (Well, actually every town in Lanzarote is “nearby”. 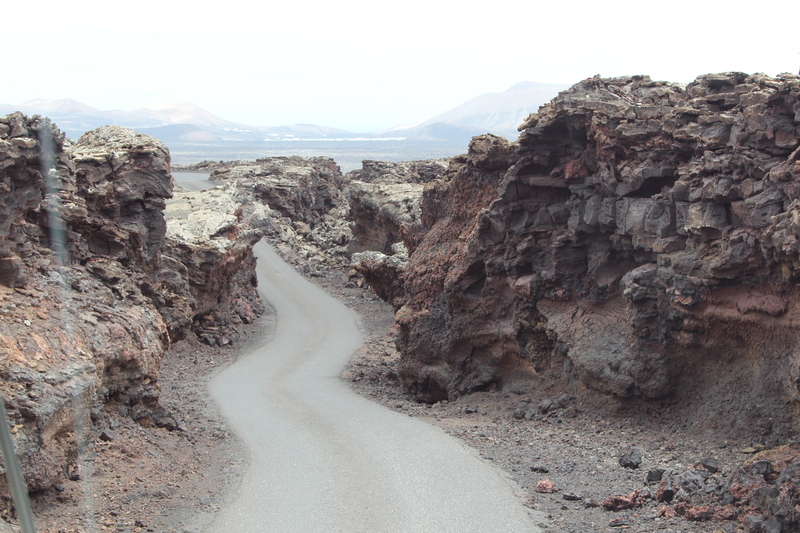 You can literally drive from one end of the island to the other, in any direction, and be there in about an hour). The boat ride itself was lovely. We had a jovial captain who grew up on the island in the pre-resort days when there was nothing on the island but a few fishermen’s shacks down on the beach. He gave us a brief history of the island as we sailed past beaches and towns and soaked in our often-missed sunshine. Unfortunately, the “glass-bottomed” part of the boat was a bit disappointing. 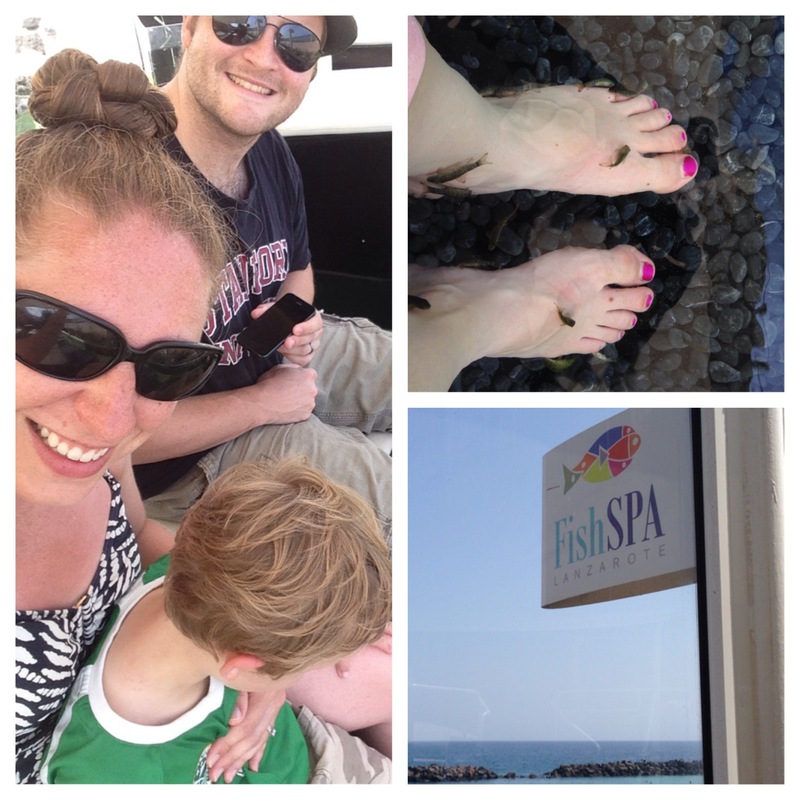 We saw a few fish and sea urchins and a starfish when we were close to the harbor where our boat docked. Other than that, though, there was not much to see in the water. Despite the lack of underwater viewings, we thoroughly enjoyed our little boat ride. 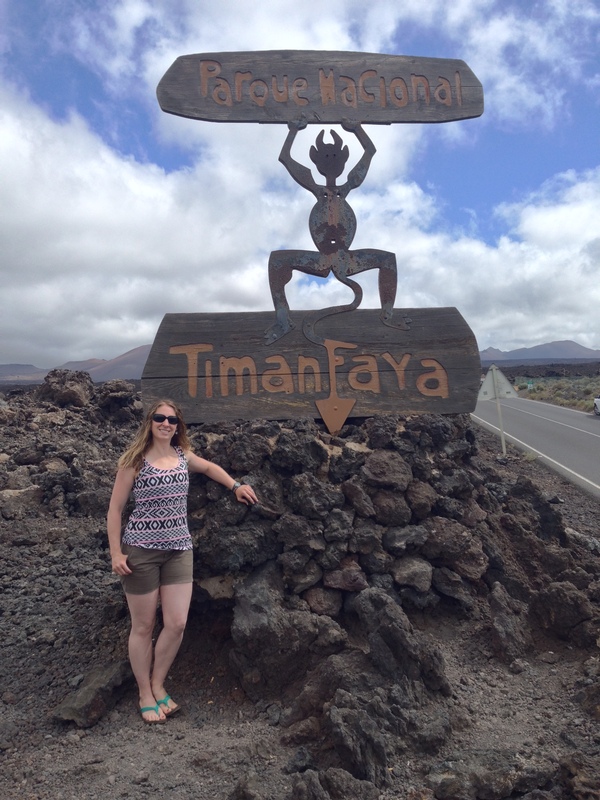 Our tour of Timanfaya concluded our exploration of the island. There were a few more sites we could have visited, but we really just wanted to spend the rest of the week relaxing at our resort. So that’s exactly what we did. We all agreed that the best buffet in the restaurant, though, was the dessert buffet. 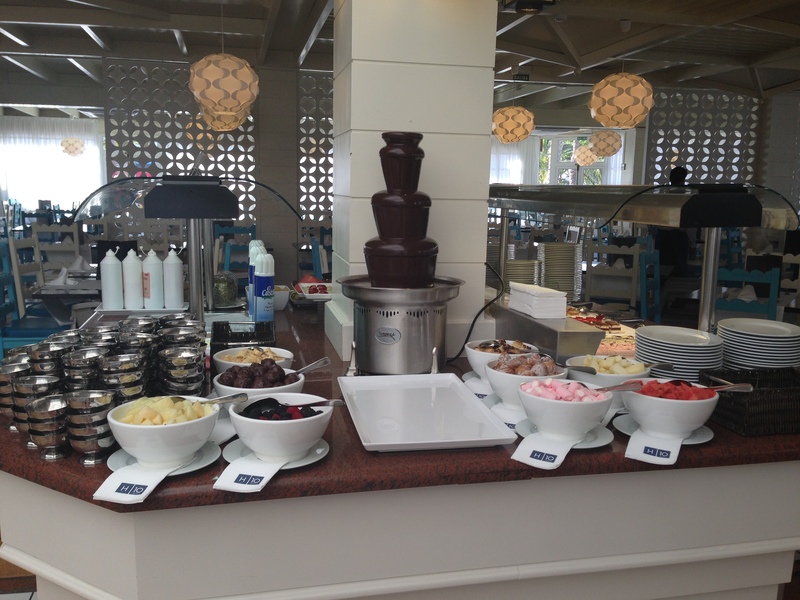 Ice cream, pies, cakes, cookies, fresh fruit and even a chocolate fountain. 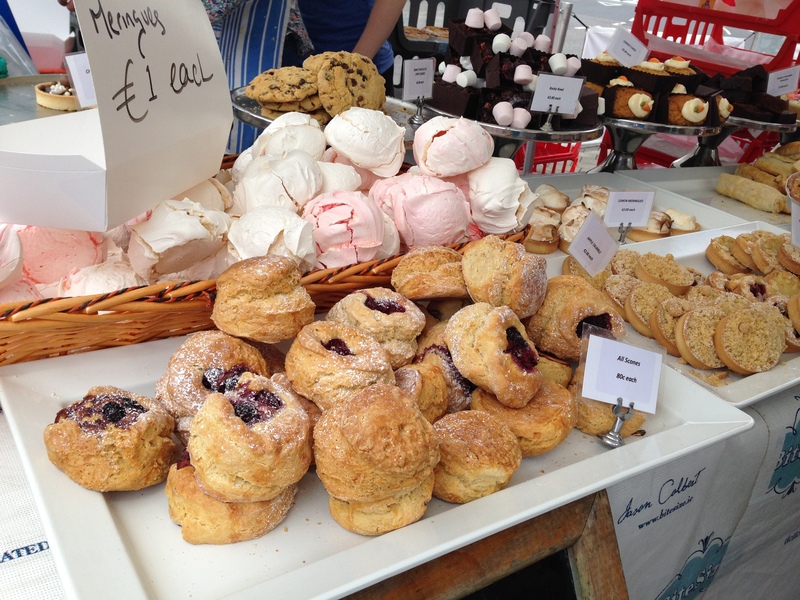 Yummmmmmm…. On Thursday Jon and I celebrated our ninth wedding anniversary! 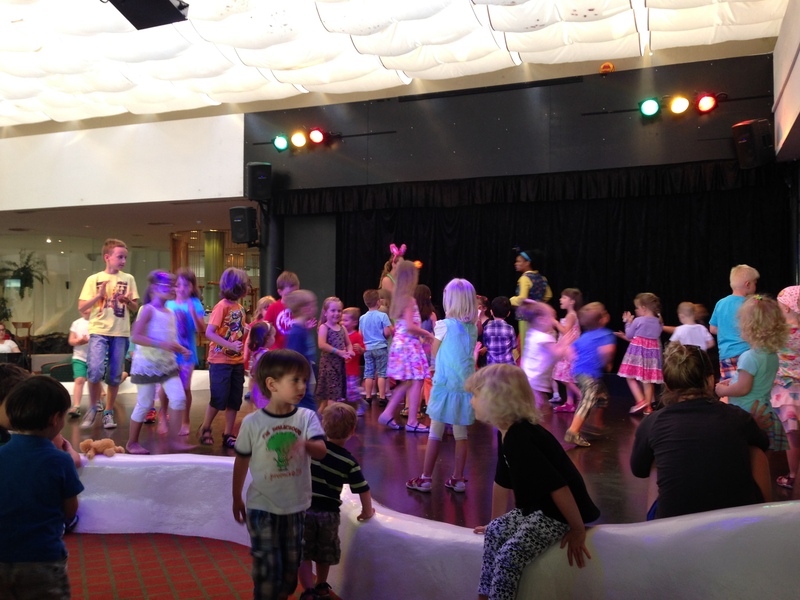 It was a special day, so we celebrated with some special activities. 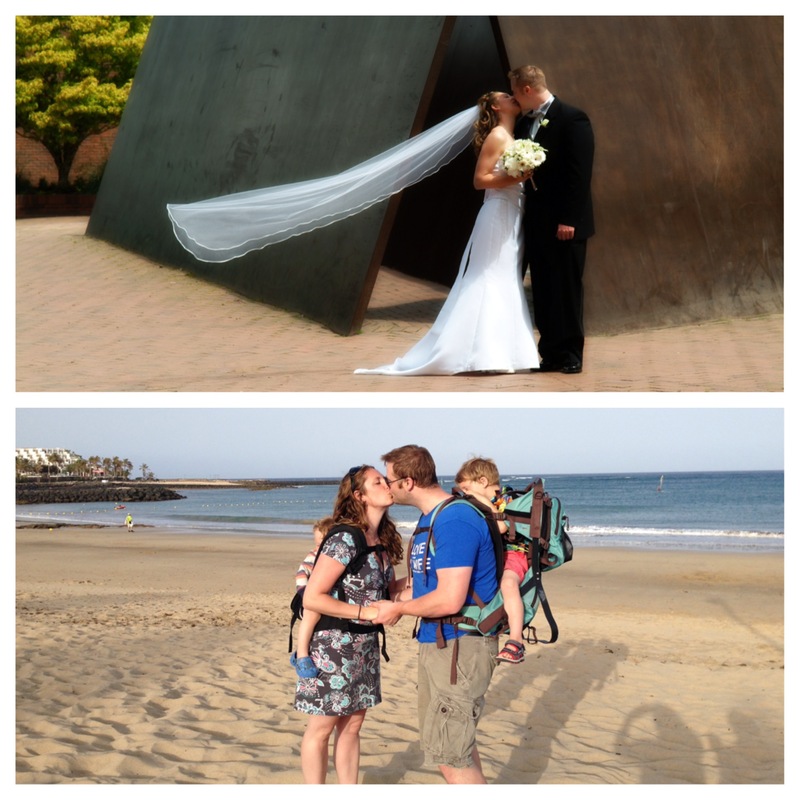 We went for a family walk on the beach and re-created one of our favorite wedding photos. My how our family has grown in the last 9 years! We went out for Mexican food and it was delicious. We drank margaritas and ate burritos and jalapeno poppers. We had a wonderful time, despite having our third- and fourth-wheels (our children) with us for our romantic evening out. And, just so we wouldn’t forget this memorable anniversary, the kids also decided to get sick at dinner. Jacob threw up all over me and had a diaper explode with diarrhea (sorry, TMI?) but, like I said, it was…memorable. 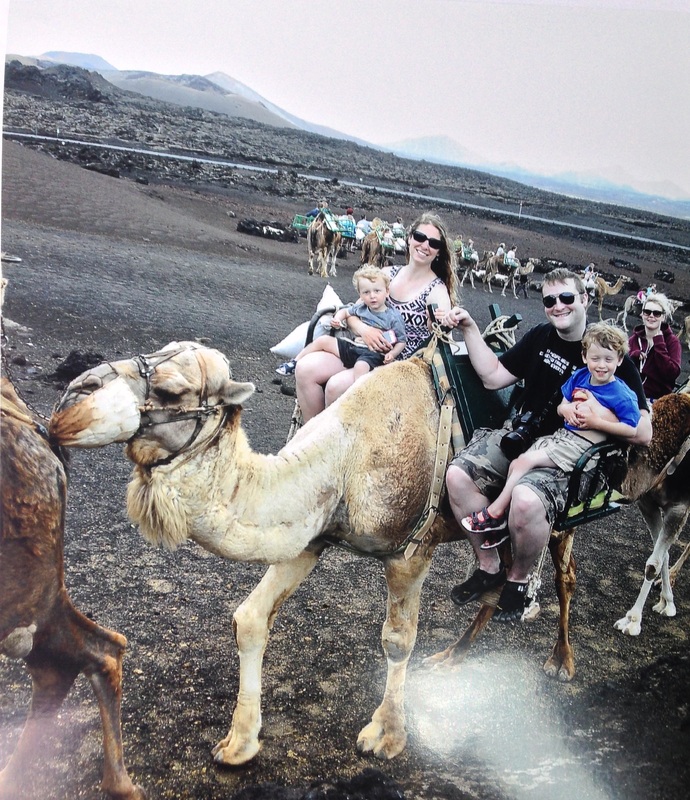 Volcanoes, camels, beaches, swimming pools, boat rides, sunshine, and some good quality time with the people I love the most–I couldn’t ask for a better vacation (well, maybe minus the sickness). Many memories were made, much fun was had, and much joy was celebrated. It was definitely a vacation none of us will ever forget! On Jon’s first Father’s Day, when I was still pregnant with our first baby, I gave him a book. The book was called Daddy Promises, and it is one of the most beautifully-written children’s books I have ever read. It is about all of the promises that dads make to their children, and how that connects to the promises that God the Father has made to us, His children. The first time I read the book I cried, and I still cry tears of joy when I re-read it. I know that my husband is demonstrating God’s love to our boys through his forgiveness and grace and bedtime wrestles. 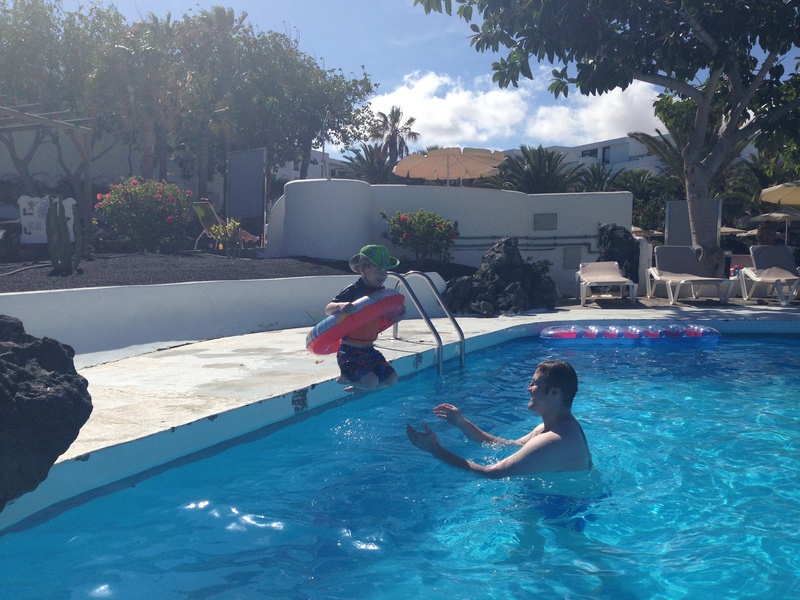 He is an amazing dad–the best dad I could have picked for my kids. The other thing I think about when I read this book is my dad–the best dad I could have picked for me. My dad is a rockstar father. He has loved me unconditionally, prayed for me unceasingly, and supported me through my most difficult times. I even remember one time that he drove up to my house, an hour away, one night just to be with me after I’d had particularly rough day at work. The time, the distance didn’t matter–he just wanted to be there for me. When I was in labor at the birth center, the hospital, wherever they took me–he was there, up all day…then all night…then all the next day in the cramped little waiting room, patiently waiting and praying for me and my baby. He is a model of Christ-like love, and he has lived out so many of God’s promises for me. In honor of Father’s Day this weekend, I have a few promises of my own that I want to share with my dad–my daughter promises. I promise to walk in faith, and to trust the One who is leading me, even when you are not there. I promise to live in the peace of Christ that you have taught me. That I will not let worry consume me or doubts take away my joy. I promise to be persevere. I have always thought that our mutual perseverance (stubbornness?) is our best trait! I promise to keep healthy and active. Otherwise I won’t be able to keep up with you when you’re running marathons in your 60’s and beyond. I promise to maintain the magic of childhood for my kids, the same way you did for me. Right now I’m working on mastering the whole “pulling off my thumb” trick. I promise to pray for you, just as you have always done for me. I promise to teach my children proper anatomy, starting with the pectoralis. I promise to love my boys the same way you love your girls: unconditional, unceasing, unrelenting parental love. I promise to love you forever and always. To all of the amazing dads out there, Happy Father’s Day! The world would not be the same without you. If you’ve been reading this blog for any length of time you’ve probably realized a few things about me: I can’t wait for my next adventure, my kids are pretty rad, and I love food. I love eating food, I love cooking food (when my rad kids aren’t getting in the way), I love reading about food. I even love just looking at food. This is not a new thing. In fact, my mom has always joked with me that all of my memories in life are somehow tied to food–what we were eating at a certain pivotal point in my life, the restaurant we visited on a vacation, the food that was served at an event. It is no wonder, then, that the food of Ireland has enthralled me. Potatoes: In the case of the Irish, the stereotype is true: they love potatoes. At the grocery store there are at least a dozen varieties of potatoes to choose from (and none of them are the basic Russet baking potato that is prevalent in America). 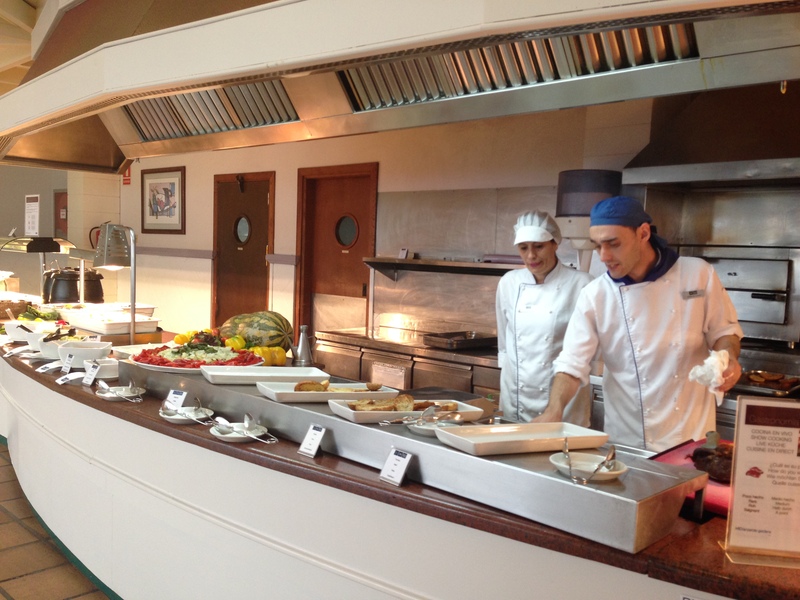 Every meal is served with some form of potato: mashed, fried, baked, roasted, boiled, stewed. The humble potato still reigns supreme. 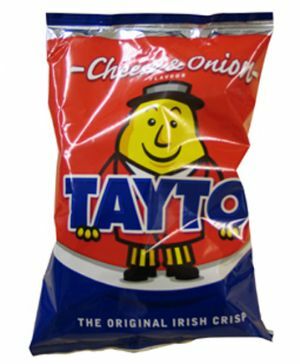 Tayto Crisps: And, while we’re on the topic of potatoes, let’s not forget about Tayto crisps (a brand of potato chips). The traditional flavor is cheese and onion, although many varieties are available. These chips are so popular that one of the largest amusement parks in the country, Tayto Park, is named after them. Cottage Pie: This is also known as shepherd’s pie (although cottage pie is typically made with beef and shepherd’s pie uses lamb). Meat, veg, and gravy topped with–you guessed it–potatoes. It’s easy to make, delicious, and one of my favorite ways to use up leftover mashed potatoes. Win, win, win. 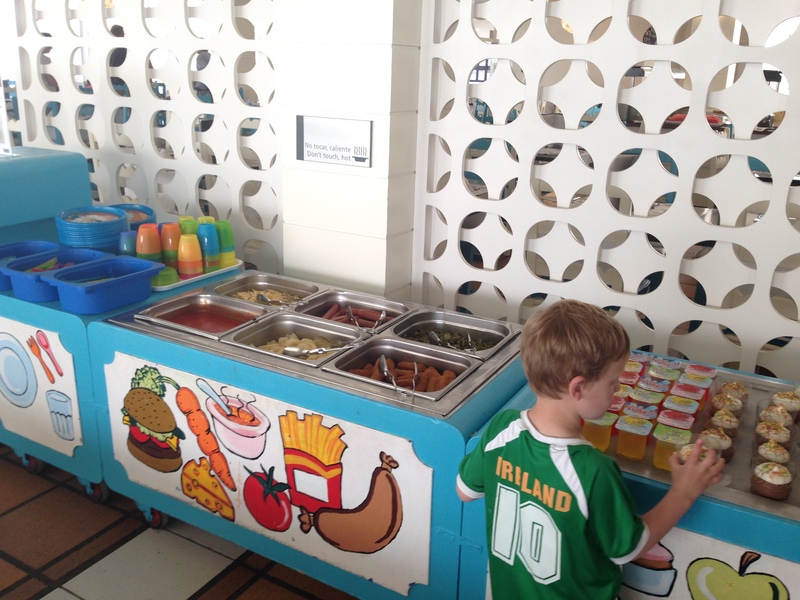 Lamb: I can not get my 3-year old to eat any meat, with one exception: Irish lamb. My son will quite literally eat a whole leg of Irish lamb if it is offered to him. It’s both interesting and completely disturbing. I don’t blame him, though. The lamb here is fresh and succulent (probably because the sheep here are so dang happy. They spend their days contentedly roaming the lush green rolling hills out in the countryside without a care in the world. Except perhaps the butcher. 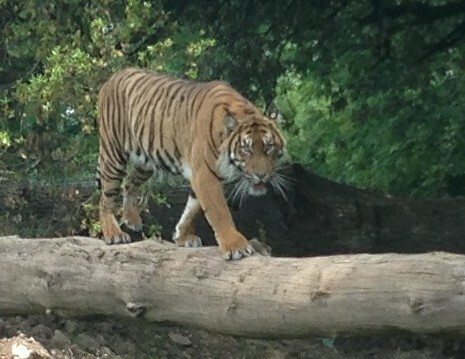 But I doubt they even notice he’s coming for their intent efforts at grazing all day. When one of their sheep friends go missing they probably just assume he’s wandered off to some other lusher greener pasture on the other side of the hill). Offal: Pig’s hooves. Yep. Pig feet. I see them every week in the butcher but I can not, will not bring myself to eat them. Offal actually refers to any bits of the animal that you would not find in your typical Michelin-Star restaurant: ears, eyes, internal organs and such. Scrumptious. Much of traditional Irish food originated in peasant cooking where it was not only practical, but absolutely necessary to eat “everything but the snout” (which, I understand, can be quite rubbery). The Full Irish Breakfast: Mom always said that breakfast was the most important meal of the day. The Irish have taken this sentiment to heart, and the traditional Irish breakfast is enough food to put you in a coma (or gear you up for a day of hard labor on your farm). 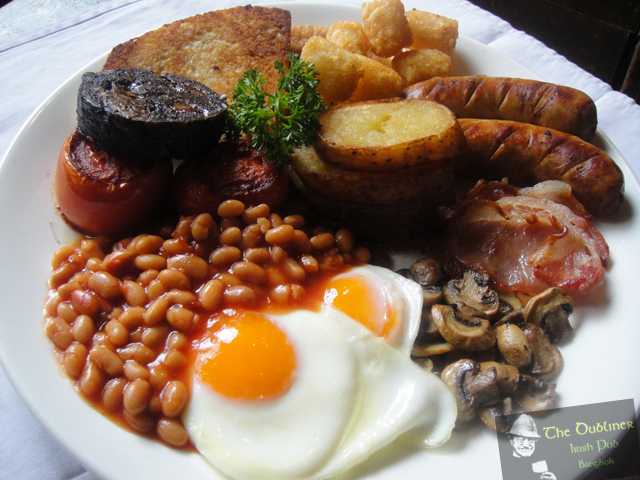 The “Full Irish” consists of black pudding, sausage, rashers (bacon), eggs, grilled mushrooms and tomatoes, potatoes, baked beans, toast, and tea. You can go to any restaurant in the country and order a “Full Irish”–just bring your appetite! Fresh Seafood: Ireland is an island. Which means the country is literally surrounded by oceans teeming with seafood. There is not a single day that goes by and I don’t see a truck or a stand on the side of the road selling fresh Atlantic fish that was caught that morning. I’m a bit of a seafood-phobic so I don’t take advantage of the abundant offerings. But if I were a lover rather than a hater, I’d be spoiled for choice. Pollock, Cod, Hake, Plaice, Monkfish, Prawns, Mussels–all just sitting there in the water waiting for some hungry person to come eat them. Scotch Eggs: A hard-boiled egg, wrapped in sausage or black pudding, breaded, and fried. What’s not to love? Pies and Pasties: When someone refers to “pie” in Ireland, they are usually talking about a savory meat or vegetable pie rather than granny’s caramel apple pie. And when they refer to “pasties”, they are usually talking about hand-pies (think of a gourmet Hot Pocket), not the–ahem–little patches that women might wear in place of a brassiere. 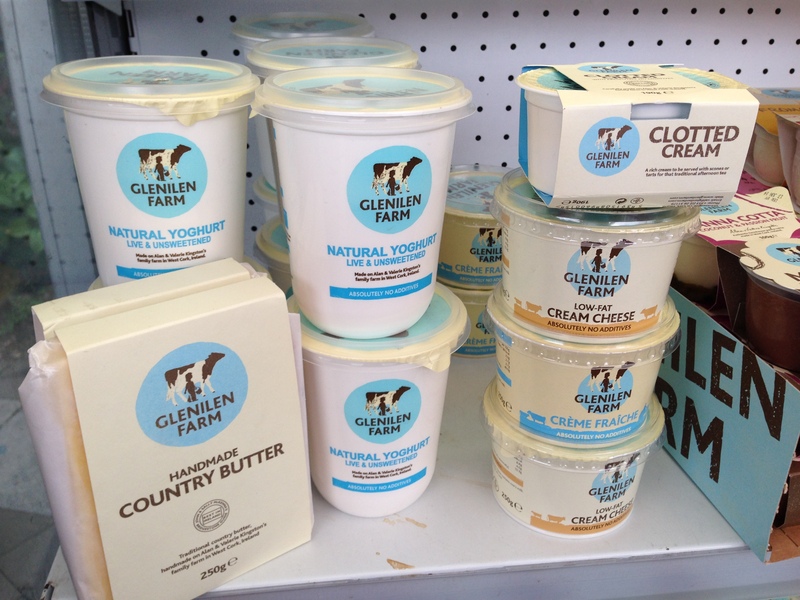 Fresh Dairy Products: You do not have to go far in Ireland to find a farm. In fact, the majority of the land in Ireland is farm land. As a result, you do not have to go far to find good, fresh dairy. Big chain grocery stores stock dairy products from the local dairies, which is pretty awesome. Fresh-from-the-cow milk, country butter, natural yogurt, cream cheese, panna cotta, clotted cream–enough lactose to fuel a nation. Gubbeen Cheese: Made on a family farm in West Cork, this cheese is a local delicacy. It has a smooth, rich, savory taste, similar to white cheddar, and it is buttery soft. Gubbeen cheese is made from milk that comes from the family’s cows that graze in their seaside pastures on the farm. And it makes a darn good grilled cheese sandwich. Banoffee Pie: A dessert made from bananas, toffee (banana-toffee = banoffee) and cream piled high in a pastry crust. You can find this pie in any coffee shop, tea cafe, restaurant, or supermarket in Ireland. They even have banoffee-flavored yogurt and pudding. Barry’s Tea: Tea is the lifeblood of Irish culture. If you took tea away from the Irish, the Irish would simply cease to exist. True story. But not just any tea will do. No, you must drink “Gold Tea”, a black tea blend and, more specifically, you must drink Barry’s Gold Tea. None of that hoity-toity herbal stuff. I mean, sure, between cups of Barry’s you might try some Jasmine tea or some orange-spice Chai just to say you’ve done it once in your life, but the purists stick with the real tea. Barry’s tea. Elderflower: I think I had heard of Elderflower before we moved to Ireland, but I certainly had never heard of eating it. Turns out, Elderflower is downright delicious. In Ireland you can find Elderflower cordial (concentrate that you add to water to make juice), Elderflower syrup, Elderflower liqueur, and Elderflower tea. Elderflower is made from the flower of the elderberry (which grows plentifully in Ireland) and it has a sweet, aromatic flavor similar to lychee. It is the perfect refreshing summer drink. So, there you have it. Now you all know why my pants fit a bit more snugly now that I’ve been living here for a year–Ireland really is a food-lover’s dream come true. The whole idea of “eat local” was born here and, really, it’s the only way people have ever eaten here. With an abundance of fresh ingredients and regional treats, Irish food offers the perfect mix between comfort food and gourmet offerings. All I have to say is, if you’re coming to Ireland, come hungry! When I came home from the hospital after having my first baby I was a bit overwhelmed. Two days earlier I had left my home with my husband and now we were returning with our souvenir: a person. A person who I had to feed and keep clean and allow to sleep while I was awake and tend to when I’d rather be sleeping. For those first few weeks I felt like all I did was breastfeed my baby and try not to think about how much every inch of my body hurt in new and unusual ways. Doing anything productive–cooking, cleaning, walking by myself to the bathroom–was out of the question. I was beyond grateful, then, when several friends offered to bring us meals during those first few weeks home. Not only did I not have to cook dinner each night, but I didn’t even have to think about it. Nor did my husband. The food just magically appeared, we woke up from our delirium long enough to eat it, and then we fell back into our new-parents trance. Why make extra work for yourself? Rather than making a special meal to bring to someone, just make a double batch of whatever you’re planning for your own family. Then bring the second serving to the person in need. Make a dish that can be easily frozen and reheated if they don’t want to eat it right now. The person you are cooking for may want to save your meal for another time–maybe they aren’t very hungry tonight, or they actually have the energy to cook right now, or their fridge is already full of leftovers from the other people who have been bringing them food. If you give them the option to freeze your meal, then it’s a gift that can be given (er…eaten…) whenever the time is right for them. Check out these 24 freezable meals if you need some inspiration. *If you do make something that can be frozen, be sure inform the recipient of this fact. Also include instructions on how to cook or reheat the meal from frozen. This is not the time to try some fancy new recipe or see what happens if you dump the entire jar of Cayenne Pepper into the soup. Cook something tried-and-true so you aren’t left scrambling at the last minute if it doesn’t work out. Make something that people with “average” palates could appreciate, especially if there are children in the family who will be sharing the meal. Also, be sure to ask the recipient in advance if they have any allergies, intolerances, or food preferences. On the off-chance that your friend really likes the food your bringing her, she may want to make it again. I always include a copy of the recipe I have prepared–if nothing else, maybe she can add it to her baby’s memory book so they can look back and remember what Mom and Dad ate while they were recovering from newborn-itis. Along with this, I always write down directions for heating/reheating the meal I’ve prepared–especially how long it will take for the food to cook. My least favorite part of cooking is certainly not the cooking. No, it’s the dishes. Those dang dishes that pile up after every meal. So, when I’m trying to help out a friend in need, I make sure they don’t have to wash a single dish. I buy foil baking dishes, Tupperware containers, Ziploc bags and paper plates when they’re on sale so I have them on hand whenever I want to bring someone a meal. When I drop off a meal I tell the recipient that I don’t want any of it back–they can clean ’em and keep ’em or just throw them away. Done deal. If I’m going to all the effort of making someone a nice meal, I want it to be…nice. That means a bottle of wine or sparkling cider. Extra sauce. Some flowers for their table. DESSERT. It’s the little things that make a difference. Restaurant takeout, pizza delivery, ready-made meals from the grocery store, take-and-bake pizzas, even grocery delivery are all great options. Plus, the best part about letting somebody else do the cooking is that you can use this option remotely and still have food delivered on your behalf. Even though we live thousands of miles away, we’ve been able to send food to several friends in Seattle this year by ordering them pizzas or having Safeway drop off some groceries at their home. There are several websites out there that make coordinating meal deliveries easy. You can include all of the pertinent information–the recipient’s name, address, directions to their house, phone number, dietary restrictions, best times for food delivery–all in one place. This makes it easy for people to sign up for a day or time to bring a meal and share what they’re bringing to help eliminate confusion. A few of my favorite meal-coordination sites are Take Them A Meal, Meal Train, and Care Calendar. When you deliver a meal to someone in need, don’t plan on making a day of it. The recipient may or may not be up for visitors right now, but don’t assume this is your chance to get some quality one-on-one time. New parents especially have their hands full, and they may just want you to quietly leave your food and move right along (so they can, you know, scarf down the only meal they’re going to eat today before the baby wakes up). Soon enough they will be ready for visitors–in fact, they’ll probably be begging for someone to come pass the time with them in a few months–but right now your mission is to bring food and leave them in peace. If you are bringing someone dinner, consider bringing along a little something extra for breakfast the next day. These meals that friends are bringing may be the only real meals this person is eating–and Mom always said that breakfast was the most important meal of the day. With a little preparation and a few thoughtful touches, you can brighten someone’s day when they need it the most–and fill their tummies while you’re at it! Now, go forth and pay it forward.